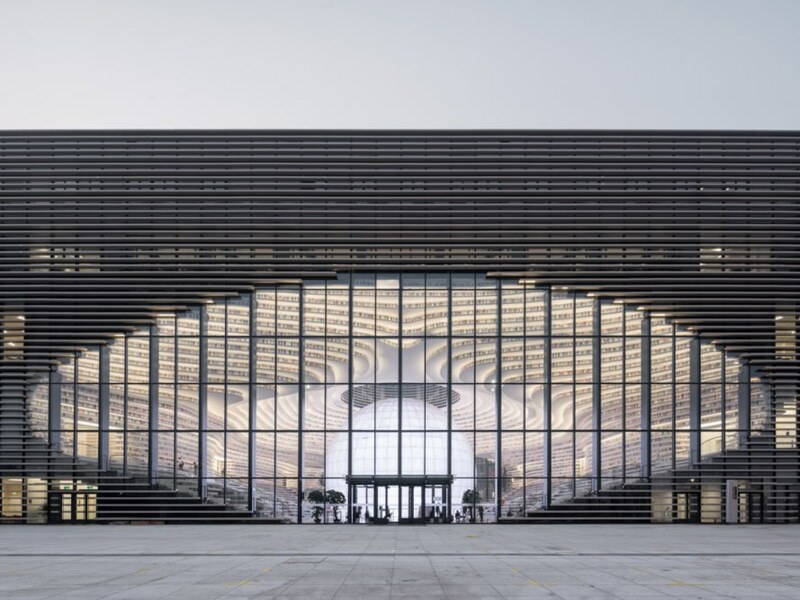 MVRDV just completed the Tianjin Binhai Public Library, a spectacular cultural center that’s unlike any library we’ve ever seen. 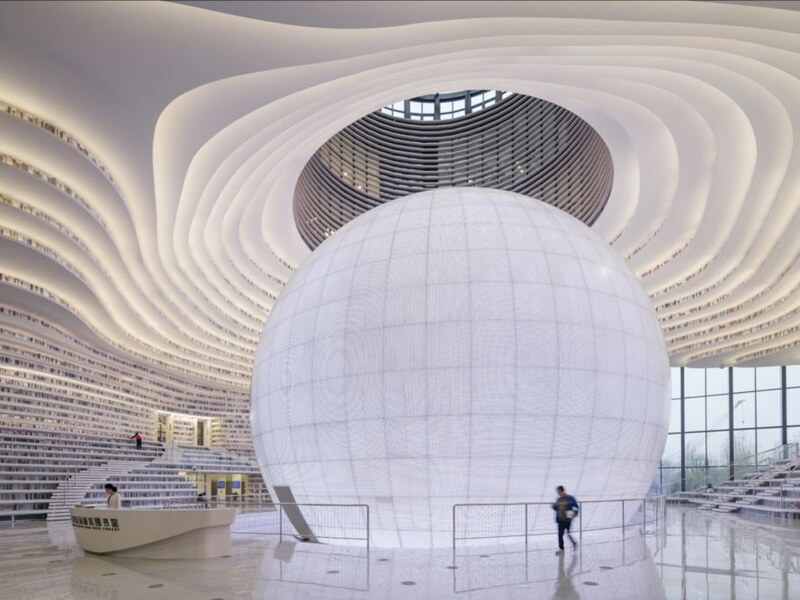 Created in collaboration with local architects TUPDI, the 33,800-square-meter library features floor-to-ceiling bookcases that cascade in curves around a luminous spherical auditorium. 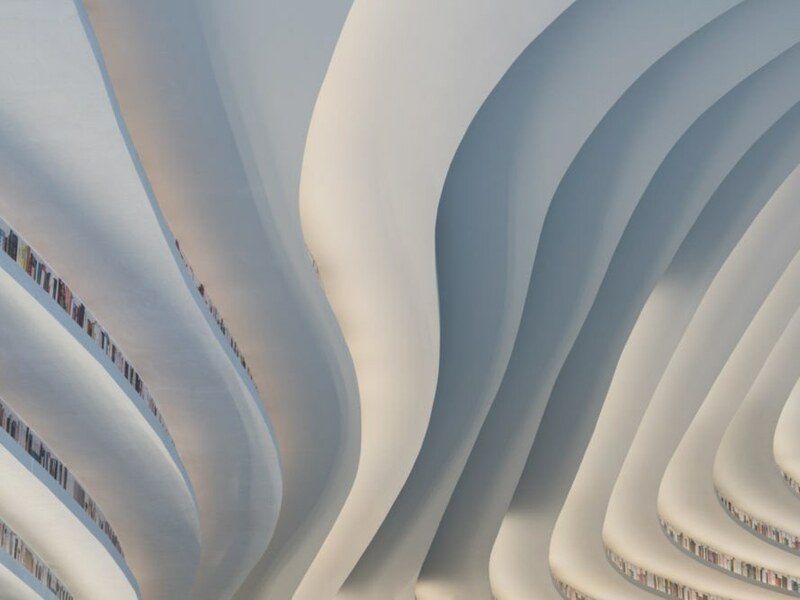 The undulating bookshelves and layered ceiling gives the cavernous library a distinctive sci-fi feel accentuated by the giant illusion of an eye visible from the outside. 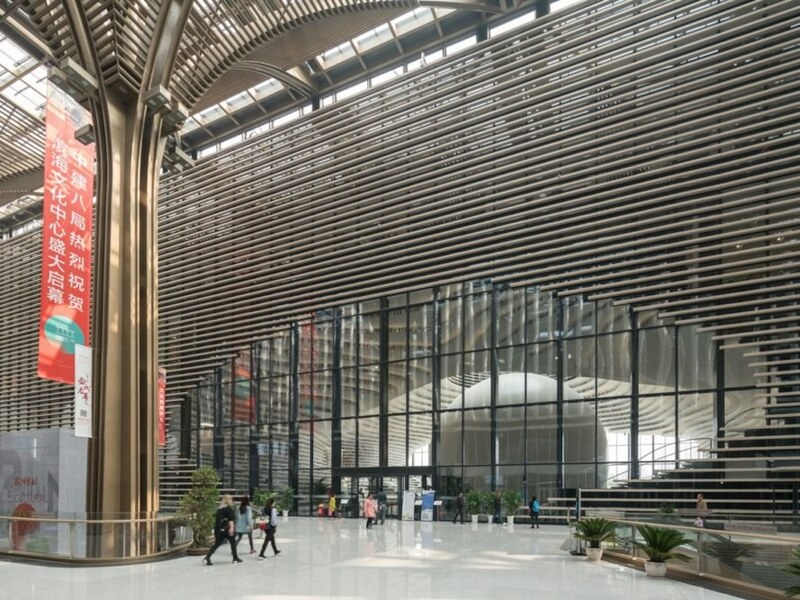 Built in record-breaking time of just three years, the Tianjin Binhai Library was constructed as part of a cluster of five cultural buildings in the Binhai district all connected by a glass-roofed public corridor. 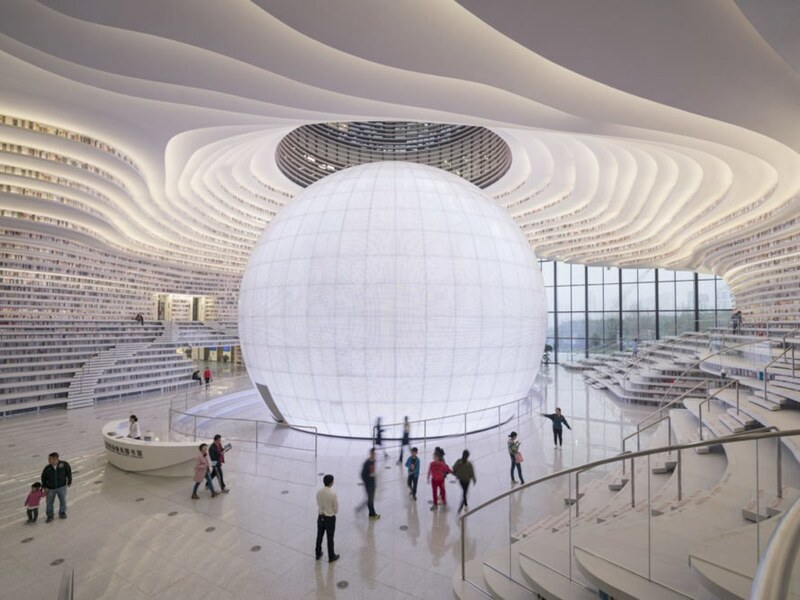 The library design is centered on the massive ball-shaped auditorium behind the information desk. Bookshelves are arranged on either side of the auditorium and ripple outwards and double as seating and stairs. These undulating contours continue to the ceiling where they’re embedded with lighting to create “illuminated topography,” and are echoed on the glass facade as curved louvers. The library’s first two floors comprise reading rooms, books, and lounge areas, while the upper floors house meeting rooms, offices, computer and audio rooms, and two rooftop patios. 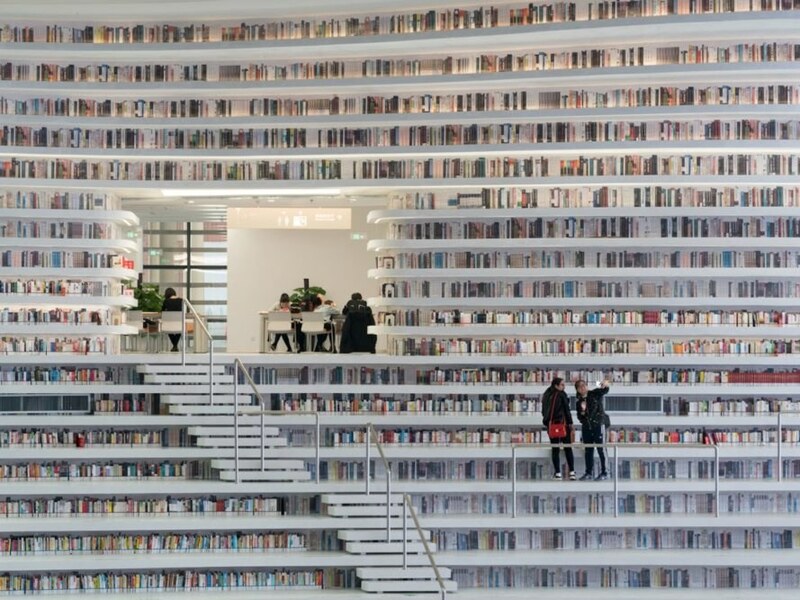 Although MVRDV designed for access to the upper bookshelves, the client decided to go against the original design due to the construction timeline. Instead, perforated aluminum plates printed to represent books were installed on the inaccessible upper shelves. Cleaning is done with ropes and movable scaffolding. 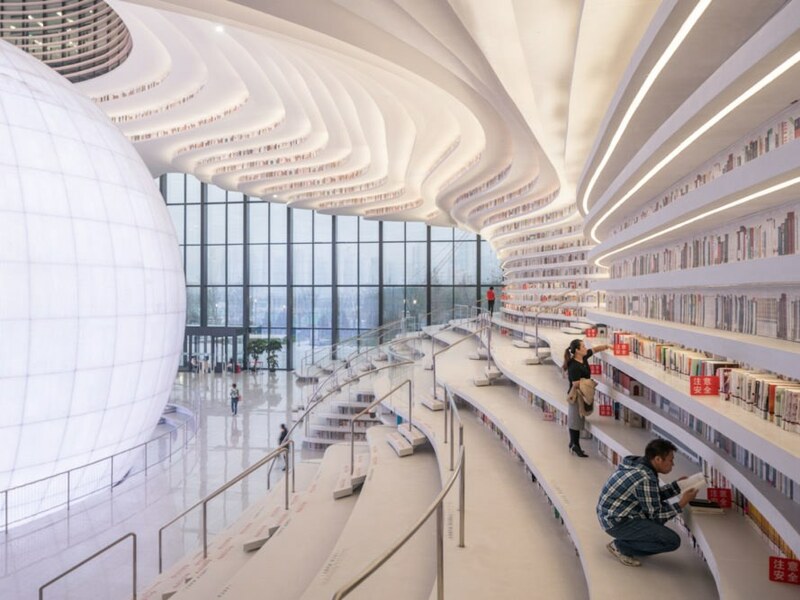 While the upper reaches of the library are out of reach, visitors don’t seem to mind; the Tianjin Binhai Library has been a massive hit with the public who have been coming to visit in droves. 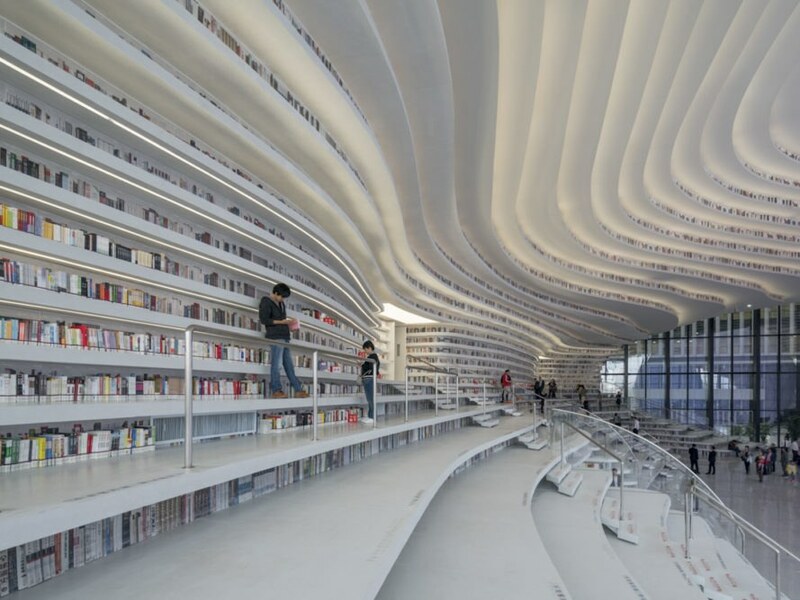 Built in record-breaking time of just three years, the Tianjin Binhai Library was constructed as part of a cluster of five cultural buildings in the Binhai district all connected by a glass-roofed public corridor. 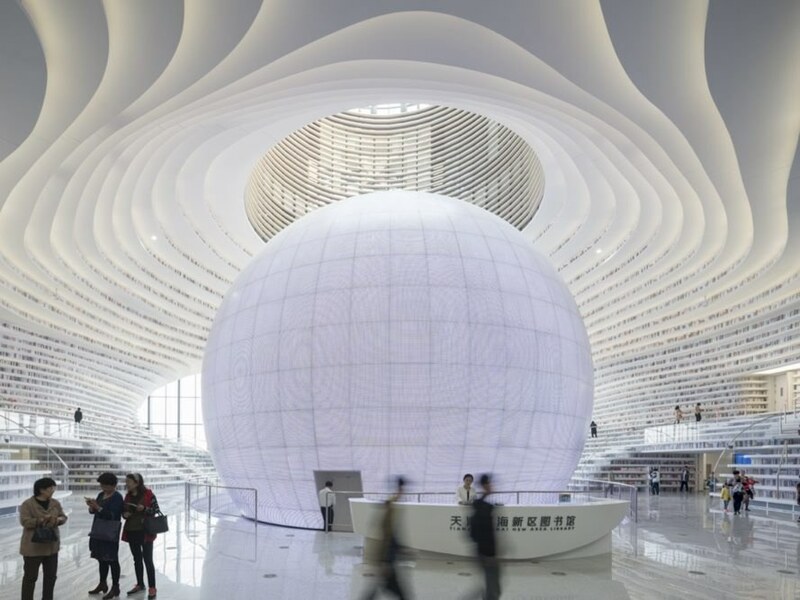 The library design is centered on the massive ball-shaped auditorium behind the information desk. Bookshelves are arranged on either side of the auditorium and ripple outwards and double as seating and stairs. These undulating contours continue to the ceiling where they’re embedded with lighting to create “illuminated topography,” and are echoed on the glass facade as curved louvers. The library’s first two floors comprise reading rooms, books, and lounge areas, while the upper floors house meeting rooms, offices, computer and audio rooms, and two rooftop patios. 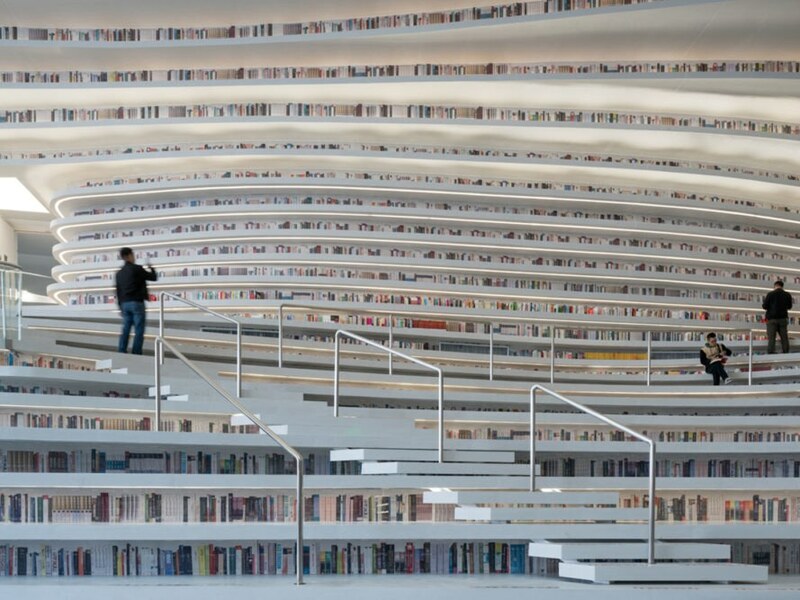 Although MVRDV designed for access to the upper bookshelves, the client decided to go against the original design due to the construction timeline. Instead, perforated aluminum plates printed to represent books were installed on the inaccessible upper shelves. Cleaning is down with ropes and movable scaffolding. 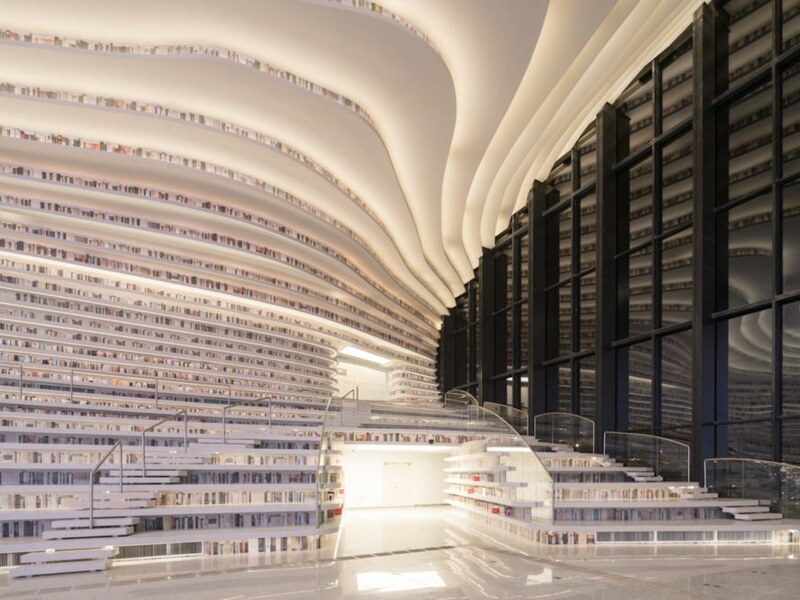 While the upper reaches of the library are out of reach, visitors don’t seem to mind; the Tianjin Binhai Library has been a massive hit with the public who have been coming to visit in droves.